This article is about the atomic variants of chemical elements. For other uses, see Isotope (disambiguation). The three naturally-occurring isotopes of hydrogen. The fact that each isotope has one proton makes them all variants of hydrogen: the identity of the isotope is given by the number of neutrons. From left to right, the isotopes are protium (1H) with zero neutrons, deuterium (2H) with one neutron, and tritium (3H) with two neutrons. Isotopes are variants of a particular chemical element which differ in neutron number. All isotopes of a given element have the same number of protons in each atom. The term isotope is formed from the Greek roots isos (ἴσος "equal") and topos (τόπος "place"), meaning "the same place"; thus, the meaning behind the name is that different isotopes of a single element occupy the same position on the periodic table. The number of protons within the atom's nucleus is called atomic number and is equal to the number of electrons in the neutral (non-ionized) atom. Each atomic number identifies a specific element, but not the isotope; an atom of a given element may have a wide range in its number of neutrons. The number of nucleons (both protons and neutrons) in the nucleus is the atom's mass number, and each isotope of a given element has a different mass number. For example, carbon-12, carbon-13 and carbon-14 are three isotopes of the element carbon with mass numbers 12, 13 and 14 respectively. The atomic number of carbon is 6, which means that every carbon atom has 6 protons, so that the neutron numbers of these isotopes are 6, 7 and 8 respectively. Nuclide refers to a nucleus rather than to an atom. Identical nuclei belong to one nuclide, for example each nucleus of the carbon-13 nuclide is composed of 6 protons and 7 neutrons. The nuclide concept (referring to individual nuclear species) emphasizes nuclear properties over chemical properties, whereas the isotope concept (grouping all atoms of each element) emphasizes chemical over nuclear. The neutron number has large effects on nuclear properties, but its effect on chemical properties is negligible for most elements. Even in the case of the lightest elements where the ratio of neutron number to atomic number varies the most between isotopes it usually has only a small effect, although it does matter in some circumstances (for hydrogen, the lightest element, the isotope effect is large enough to strongly affect biology). Because isotope is the older term, it is better known than nuclide, and is still sometimes used in contexts where nuclide might be more appropriate, such as nuclear technology and nuclear medicine. are stable isotopes. There are about 339 naturally occurring nuclides on Earth, of which 286 are primordial nuclides, meaning that they have existed since the Solar System's formation. Primordial nuclides include 32 nuclides with very long half-lives (over 100 million years) and 254 that are formally considered as "stable nuclides", because they have not been observed to decay. In most cases, for obvious reasons, if an element has stable isotopes, those isotopes predominate in the elemental abundance found on Earth and in the Solar System. However, in the cases of three elements (tellurium, indium, and rhenium) the most abundant isotope found in nature is actually one (or two) extremely long-lived radioisotope(s) of the element, despite these elements having one or more stable isotopes. Theory predicts that many apparently "stable" isotopes/nuclides are radioactive, with extremely long half-lives (discounting the possibility of proton decay, which would make all nuclides ultimately unstable). Of the 254 nuclides never observed to decay, only 90 of these (all from the first 40 elements) are theoretically stable to all known forms of decay. Element 41 (niobium) is theoretically unstable via spontaneous fission, but this has never been detected. Many other stable nuclides are in theory energetically susceptible to other known forms of decay, such as alpha decay or double beta decay, but no decay products have yet been observed, and so these isotopes are said to be "observationally stable". 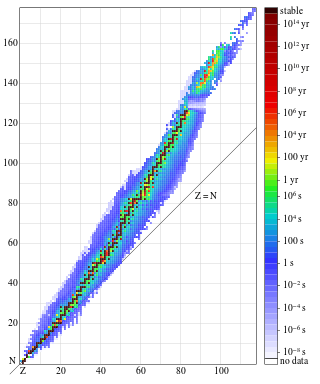 The predicted half-lives for these nuclides often greatly exceed the estimated age of the universe, and in fact there are also 27 known radionuclides (see primordial nuclide) with half-lives longer than the age of the universe. Adding in the radioactive nuclides that have been created artificially, there are 3,339 currently known nuclides. These include 905 nuclides that are either stable or have half-lives longer than 60 minutes. See list of nuclides for details. The existence of isotopes was first suggested in 1913 by the radiochemist Frederick Soddy, based on studies of radioactive decay chains that indicated about 40 different species referred to as radioelements (i.e. radioactive elements) between uranium and lead, although the periodic table only allowed for 11 elements from uranium to lead. Several attempts to separate these new radioelements chemically had failed. For example, Soddy had shown in 1910 that mesothorium (later shown to be 228Ra), radium (226Ra, the longest-lived isotope), and thorium X (224Ra) are impossible to separate. Attempts to place the radioelements in the periodic table led Soddy and Kazimierz Fajans independently to propose their radioactive displacement law in 1913, to the effect that alpha decay produced an element two places to the left in the periodic table, whereas beta decay emission produced an element one place to the right. Soddy recognized that emission of an alpha particle followed by two beta particles led to the formation of an element chemically identical to the initial element but with a mass four units lighter and with different radioactive properties. Soddy proposed that several types of atoms (differing in radioactive properties) could occupy the same place in the table. For example, the alpha-decay of uranium-235 forms thorium-231, whereas the beta decay of actinium-230 forms thorium-230. The term "isotope", Greek for "at the same place", was suggested to Soddy by Margaret Todd, a Scottish physician and family friend, during a conversation in which he explained his ideas to her. In 1914 T. W. Richards found variations between the atomic weight of lead from different mineral sources, attributable to variations in isotopic composition due to different radioactive origins. The first evidence for multiple isotopes of a stable (non-radioactive) element was found by J. J. Thomson in 1913 as part of his exploration into the composition of canal rays (positive ions). Thomson channeled streams of neon ions through a magnetic and an electric field and measured their deflection by placing a photographic plate in their path. Each stream created a glowing patch on the plate at the point it struck. Thomson observed two separate patches of light on the photographic plate (see image), which suggested two different parabolas of deflection. Thomson eventually concluded that some of the atoms in the neon gas were of higher mass than the rest. F. W. Aston subsequently discovered multiple stable isotopes for numerous elements using a mass spectrograph. In 1919 Aston studied neon with sufficient resolution to show that the two isotopic masses are very close to the integers 20 and 22, and that neither is equal to the known molar mass (20.2) of neon gas. This is an example of Aston's whole number rule for isotopic masses, which states that large deviations of elemental molar masses from integers are primarily due to the fact that the element is a mixture of isotopes. Aston similarly showed that the molar mass of chlorine (35.45) is a weighted average of the almost integral masses for the two isotopes 35Cl and 37Cl. A neutral atom has the same number of electrons as protons. Thus different isotopes of a given element all have the same number of electrons and share a similar electronic structure. Because the chemical behavior of an atom is largely determined by its electronic structure, different isotopes exhibit nearly identical chemical behavior. Similarly, two molecules that differ only in the isotopes of their atoms (isotopologues) have identical electronic structure, and therefore almost indistinguishable physical and chemical properties (again with deuterium and tritium being the primary exceptions). The vibrational modes of a molecule are determined by its shape and by the masses of its constituent atoms; so different isotopologues have different sets of vibrational modes. Because vibrational modes allow a molecule to absorb photons of corresponding energies, isotopologues have different optical properties in the infrared range. (calcium-40) is observationally the heaviest stable nuclide with the same number of neutrons and protons; (theoretically, the heaviest stable one is sulfur-32). All stable nuclides heavier than calcium-40 contain more neutrons than protons. as stable), and 26 elements have only a single stable isotope (of these, 19 are so-called mononuclidic elements, having a single primordial stable isotope that dominates and fixes the atomic weight of the natural element to high precision; 3 radioactive mononuclidic elements occur as well). In total, there are 254 nuclides that have not been observed to decay. For the 80 elements that have one or more stable isotopes, the average number of stable isotopes is 254/80 = 3.2 isotopes per element. The majority of stable nuclides are even-proton-even-neutron, where all numbers Z, N, and A are even. The odd-A stable nuclides are divided (roughly evenly) into odd-proton-even-neutron, and even-proton-odd-neutron nuclides. Odd-proton-odd-neutron nuclei are the least common. The 148 even-proton, even-neutron (EE) nuclides comprise ~ 58% of all stable nuclides and all have spin 0 because of pairing. There are also 22 primordial long-lived even-even nuclides. As a result, each of the 41 even-numbered elements from 2 to 82 has at least one stable isotope, and most of these elements have several primordial isotopes. Half of these even-numbered elements have six or more stable isotopes. The extreme stability of helium-4 due to a double pairing of 2 protons and 2 neutrons prevents any nuclides containing five or eight nucleons from existing for long enough to serve as platforms for the buildup of heavier elements via nuclear fusion in stars (see triple alpha process). are the most naturally abundant isotopes of their element. ), have two odd-even stable isotopes each. This makes a total 30 + 2(9) = 48 stable odd-even isotopes.
. The last two were only recently found to decay, with half-lives greater than 1018 years. (spin 9) is thought to be the rarest of the 254 stable isotopes, and is the only primordial nuclear isomer, which has not yet been observed to decay despite experimental attempts. are minority isotopes of elements that are themselves rare compared to other light elements, whereas the other six isotopes make up only a tiny percentage of the natural abundance of their elements. Actinides with odd neutron number are generally fissile (with thermal neutrons), whereas those with even neutron number are generally not, though they are fissionable with fast neutrons. All observationally stable odd-odd nuclides have nonzero integer spin. This is because the single unpaired neutron and unpaired proton have a larger nuclear force attraction to each other if their spins are aligned (producing a total spin of at least 1 unit), instead of anti-aligned. 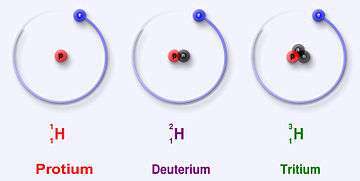 See deuterium for the simplest case of this nuclear behavior. have odd neutron number and are the most naturally abundant isotope of their element. Elements are composed of one or more naturally occurring isotopes. The unstable (radioactive) isotopes are either primordial or postprimordial. Primordial isotopes were a product of stellar nucleosynthesis or another type of nucleosynthesis such as cosmic ray spallation, and have persisted down to the present because their rate of decay is so slow (e.g. uranium-238 and potassium-40). Post-primordial isotopes were created by cosmic ray bombardment as cosmogenic nuclides (e.g., tritium, carbon-14), or by the decay of a radioactive primordial isotope to a radioactive radiogenic nuclide daughter (e.g. uranium to radium). A few isotopes are naturally synthesized as nucleogenic nuclides, by some other natural nuclear reaction, such as when neutrons from natural nuclear fission are absorbed by another atom. ). There are about 94 elements found naturally on Earth (up to plutonium inclusive), though some are detected only in very tiny amounts, such as plutonium-244. Scientists estimate that the elements that occur naturally on Earth (some only as radioisotopes) occur as 339 isotopes (nuclides) in total. Only 254 of these naturally occurring isotopes are stable in the sense of never having been observed to decay as of the present time. An additional 35 primordial nuclides (to a total of 289 primordial nuclides), are radioactive with known half-lives, but have half-lives longer than 80 million years, allowing them to exist from the beginning of the Solar System. See list of nuclides for details. All the known stable isotopes occur naturally on Earth; the other naturally occurring-isotopes are radioactive but occur on Earth due to their relatively long half-lives, or else due to other means of ongoing natural production. These include the afore-mentioned cosmogenic nuclides, the nucleogenic nuclides, and any radiogenic radioisotopes formed by ongoing decay of a primordial radioactive isotope, such as radon and radium from uranium. An additional ~3000 radioactive isotopes not found in nature have been created in nuclear reactors and in particle accelerators. Many short-lived isotopes not found naturally on Earth have also been observed by spectroscopic analysis, being naturally created in stars or supernovae. An example is aluminium-26, which is not naturally found on Earth, but is found in abundance on an astronomical scale. The tabulated atomic masses of elements are averages that account for the presence of multiple isotopes with different masses. Before the discovery of isotopes, empirically determined noninteger values of atomic mass confounded scientists. For example, a sample of chlorine contains 75.8% chlorine-35 and 24.2% chlorine-37, giving an average atomic mass of 35.5 atomic mass units. According to generally accepted cosmology theory, only isotopes of hydrogen and helium, traces of some isotopes of lithium and beryllium, and perhaps some boron, were created at the Big Bang, while all other isotopes were synthesized later, in stars and supernovae, and in interactions between energetic particles such as cosmic rays, and previously produced isotopes. (See nucleosynthesis for details of the various processes thought responsible for isotope production.) The respective abundances of isotopes on Earth result from the quantities formed by these processes, their spread through the galaxy, and the rates of decay for isotopes that are unstable. After the initial coalescence of the Solar System, isotopes were redistributed according to mass, and the isotopic composition of elements varies slightly from planet to planet. This sometimes makes it possible to trace the origin of meteorites. The atomic mass (mr) of an isotope is determined mainly by its mass number (i.e. number of nucleons in its nucleus). Small corrections are due to the binding energy of the nucleus (see mass defect), the slight difference in mass between proton and neutron, and the mass of the electrons associated with the atom, the latter because the electron:nucleon ratio differs among isotopes. The mass number is a dimensionless quantity. The atomic mass, on the other hand, is measured using the atomic mass unit based on the mass of the carbon-12 atom. It is denoted with symbols "u" (for unified atomic mass unit) or "Da" (for dalton). where m1, m2, …, mN are the atomic masses of each individual isotope, and x1, …, xN are the relative abundances of these isotopes. Several applications exist that capitalize on properties of the various isotopes of a given element. Isotope separation is a significant technological challenge, particularly with heavy elements such as uranium or plutonium. Lighter elements such as lithium, carbon, nitrogen, and oxygen are commonly separated by gas diffusion of their compounds such as CO and NO. The separation of hydrogen and deuterium is unusual because it is based on chemical rather than physical properties, for example in the Girdler sulfide process. Uranium isotopes have been separated in bulk by gas diffusion, gas centrifugation, laser ionization separation, and (in the Manhattan Project) by a type of production mass spectrometry. Isotope analysis is the determination of isotopic signature, the relative abundances of isotopes of a given element in a particular sample. For biogenic substances in particular, significant variations of isotopes of C, N and O can occur. Analysis of such variations has a wide range of applications, such as the detection of adulteration in food products or the geographic origins of products using isoscapes. The identification of certain meteorites as having originated on Mars is based in part upon the isotopic signature of trace gases contained in them. Isotopic substitution can be used to determine the mechanism of a chemical reaction via the kinetic isotope effect. Another common application is isotopic labeling, the use of unusual isotopes as tracers or markers in chemical reactions. Normally, atoms of a given element are indistinguishable from each other. However, by using isotopes of different masses, even different nonradioactive stable isotopes can be distinguished by mass spectrometry or infrared spectroscopy. For example, in 'stable isotope labeling with amino acids in cell culture (SILAC)' stable isotopes are used to quantify proteins. If radioactive isotopes are used, they can be detected by the radiation they emit (this is called radioisotopic labeling). Isotopes are commonly used to determine the concentration of various elements or substances using the isotope dilution method, whereby known amounts of isotopically-substituted compounds are mixed with the samples and the isotopic signatures of the resulting mixtures are determined with mass spectrometry. A technique similar to radioisotopic labeling is radiometric dating: using the known half-life of an unstable element, one can calculate the amount of time that has elapsed since a known concentration of isotope existed. The most widely known example is radiocarbon dating used to determine the age of carbonaceous materials. Several forms of spectroscopy rely on the unique nuclear properties of specific isotopes, both radioactive and stable. For example, nuclear magnetic resonance (NMR) spectroscopy can be used only for isotopes with a nonzero nuclear spin. The most common isotopes used with NMR spectroscopy are 1H, 2D,15N, 13C, and 31P. Mössbauer spectroscopy also relies on the nuclear transitions of specific isotopes, such as 57Fe. Radionuclides also have important uses. Nuclear power and nuclear weapons development require relatively large quantities of specific isotopes. Nuclear medicine and radiation oncology utilize radioisotopes respectively for medical diagnosis and treatment. Isotones are nuclides having the same number of neutrons. Isobars are nuclides having the same mass number, i.e. sum of protons plus neutrons. Isodiaphers are nuclides having the same neutron excess, i.e. number of neutrons minus number of protons. ↑ This notation seems to have been introduced in the second half of the 1930s. Before that, various notations were used, such as Ne(22) for neon-22 (1934), Ne22 for neon-22 (1935), or even Pb210 for lead-210 (1933). 1 2 "Radioactives Missing From The Earth". ↑ "NuDat 2 Description". Retrieved 2 January 2016. Strömholm, Daniel and Svedberg, Theodor (1909) "Untersuchungen über die Chemie der radioactiven Grundstoffe II." (Investigations into the chemistry of the radioactive elements, part 2), Zeitschrift für anorganischen Chemie, 63: 197–206; see especially page 206. 1 2 Nagel, Miriam C. (1982). "Frederick Soddy: From Alchemy to Isotopes". Journal of Chemical Education. 59 (9): 739–740. Bibcode:1982JChEd..59..739N. doi:10.1021/ed059p739. Kasimir Fajans (1913) "Über eine Beziehung zwischen der Art einer radioaktiven Umwandlung und dem elektrochemischen Verhalten der betreffenden Radioelemente" (On a relation between the type of radioactive transformation and the electrochemical behavior of the relevant radioactive elements), Physikalische Zeitschrift, 14: 131–136. Soddy announced his "displacement law" in: Soddy, Frederick (1913). "The Radio-Elements and the Periodic Law". Nature. 91 (2264): 57. Bibcode:1913Natur..91...57S. doi:10.1038/091057a0. .
Soddy elaborated his displacement law in: Soddy, Frederick (1913) "Radioactivity," Chemical Society Annual Report, 10: 262–288. Alexander Smith Russell (1888–1972) also published a displacement law: Russell, Alexander S. (1913) "The periodic system and the radio-elements," Chemical News and Journal of Industrial Science, 107: 49–52. ↑ Soddy first used the word "isotope" in: Soddy, Frederick (1913). "Intra-atomic charge". Nature. 92 (2301): 399–400. Bibcode:1913Natur..92..399S. doi:10.1038/092399c0. ↑ Fleck, Alexander (1957). "Frederick Soddy". Biographical Memoirs of Fellows of the Royal Society. 3: 203–216. doi:10.1098/rsbm.1957.0014. p. 208: Up to 1913 we used the phrase 'radio elements chemically non-separable' and at that time the word isotope was suggested in a drawing-room discussion with Dr. Margaret Todd in the home of Soddy's father-in-law, Sir George Beilby. ↑ Budzikiewicz H, Grigsby RD (2006). "Mass spectrometry and isotopes: a century of research and discussion". Mass spectrometry reviews. 25 (1): 146–57. doi:10.1002/mas.20061. PMID 16134128. ↑ Scerri, Eric R. (2007) The Periodic Table, Oxford University Press, ISBN 0-19-530573-6, Ch. 6, note 44 (p. 312) citing Alexander Fleck, described as a former student of Soddy's. ↑ Thomson, J. J. (1912). "XIX. Further experiments on positive rays". Philosophical Magazine Series 6. 24 (140): 209. doi:10.1080/14786440808637325. ↑ Thomson, J. J. (1910). "LXXXIII. Rays of positive electricity". Philosophical Magazine Series 6. 20 (118): 752. doi:10.1080/14786441008636962. ↑ Sonzogni, Alejandro (2008). "Interactive Chart of Nuclides". National Nuclear Data Center: Brookhaven National Laboratory. Retrieved 2013-05-03. ↑ Hult, Mikael; Wieslander, J. S.; Marissens, Gerd; Gasparro, Joël; Wätjen, Uwe; Misiaszek, Marcin (2009). "Search for the radioactivity of 180mTa using an underground HPGe sandwich spectrometer". Applied Radiation and Isotopes. 67 (5): 918–21. doi:10.1016/j.apradiso.2009.01.057. PMID 19246206. ↑ "Radioactives Missing From The Earth". Don-lindsay-archive.org. Retrieved 2012-06-16. ↑ Jamin, Eric; Guérin, Régis; Rétif, Mélinda; Lees, Michèle; Martin, Gérard J. (2003). "Improved Detection of Added Water in Orange Juice by Simultaneous Determination of the Oxygen-18/Oxygen-16 Isotope Ratios of Water and Ethanol Derived from Sugars". J. Agric. Food Chem. 51 (18): 5202. doi:10.1021/jf030167m. ↑ Treiman, A. H.; Gleason, J. D.; Bogard, D. D. (2000). "The SNC meteorites are from Mars". Planet. Space Sci. 48 (12–14): 1213. Bibcode:2000P&SS...48.1213T. doi:10.1016/S0032-0633(00)00105-7. The LIVEChart of Nuclides – IAEA with isotope data.